During the second day of the BVI Asian Trade Mission’s stop in Beijing, Premier and Minister of Finance & Tourism, Dr. the Honourable D. Orlando Smith, OBE and his delegation met with Vice Chairman Li Shihong and other senior members of the marketing and international cooperation departments of the China National Tourism Association (CNTA) to familiarise the organisation with the British Virgin Islands (BVI) as a tourism destination. As part of the meeting, the BVI delegation shared a video that showcased the Territory, and they were pleased with the response of officials of the CNTA as they marvelled at the Territory’s scenic natural beauty. 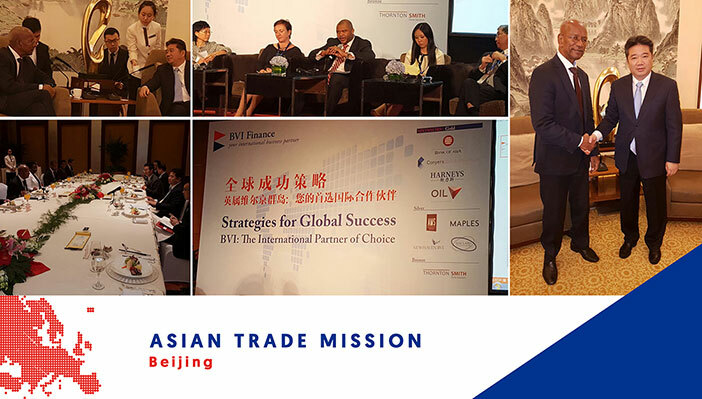 Additionally, the first in a series of roadshows hosted by BVI Finance during the BVI Asian Trade Mission was held in Beijing today. The roadshow was held under the theme “Strategies for Global Success – BVI: The International Partner of Choice”and featured an impressive welcome in Beijing’s native language by Executive Director of BVI House Asia, Ms. Elise Donovan, a keynote speech by Premier Smith and various panel discussions on the BVI advantage. The event culminated with a networking session where the delegation was able to conduct one-on-one discussions with the audience. For regular updates on the BVI’s Asian Trade Mission, visit the Government’s website at bvi.gov.vg or follow on Facebook, YouTube or Twitter: @BVIGovernment. The public can also visit the BVI Finance website atbvifinance.vg, or follow @BVIFinance on Facebook, Twitter and LinkedIn.